When teaching Art History I always stress to my students that art exists within social and historical contexts. It matters where you see a work of art, as do the things that surround it. Meanings emerge and change -- sometimes slightly, sometimes dramatically -- in relation to context. 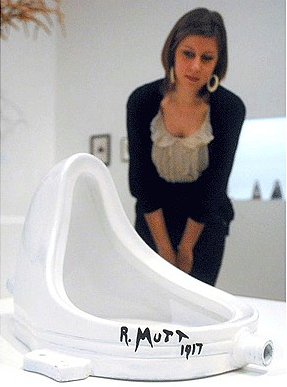 Modern and contemporary artists have been well aware of this situation: social context is the reason that Marcel Duchamp's Fountain created a such sense of shock when it was first exhibited as a "work of art." 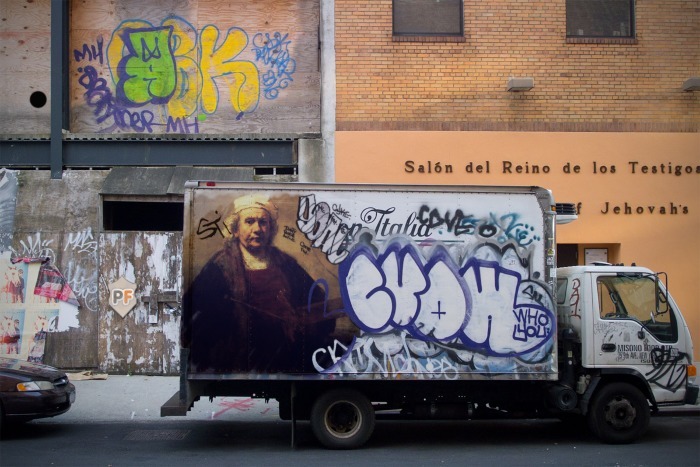 By turning Duchamp's thinking around, I have recently been using the instant photo collage generating website Photofunia as a way to virtually re-contextualize well known works of art. Interesting things happen when you take works of art outside of museums and galleries. As it turns out, the results don't always seem so odd, as we live in a media society where we commonly see works of art in advertisements. Despite that, I had some fun shifting contexts and hope that some of these Photofunia collages will at least make you think or smile. 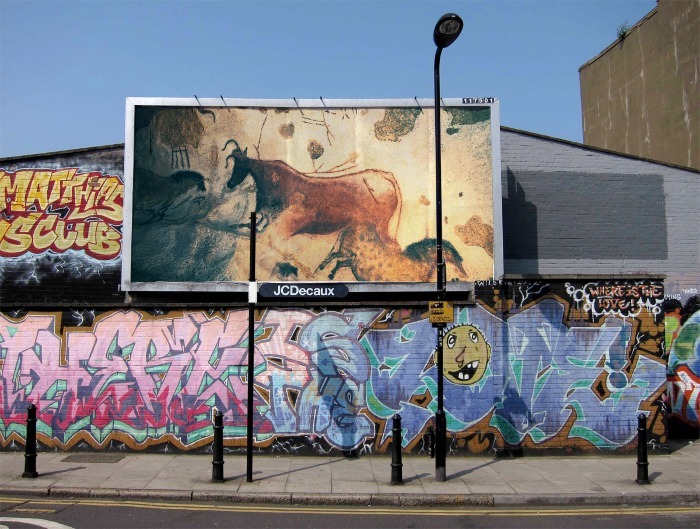 On the other hand, the graphic energy of the animals in the Paleolithic Hall of the Bulls at Lascaux fits in rather well with the vibe or urban graffiti: a shared human impulse to decorate surfaces comes to the forefront. A Diego Velasquez portrait of a Spanish Infanta (princess), painted to advertise her desireability as a child bride, makes a very formal and awkward beer bottle label. An odalisque from Picasso's Women of Algiers fares rather better in replacing Benjamin Franklin on a $100 bill, since Picasso's paintings seem to have themselves become a form of currency. 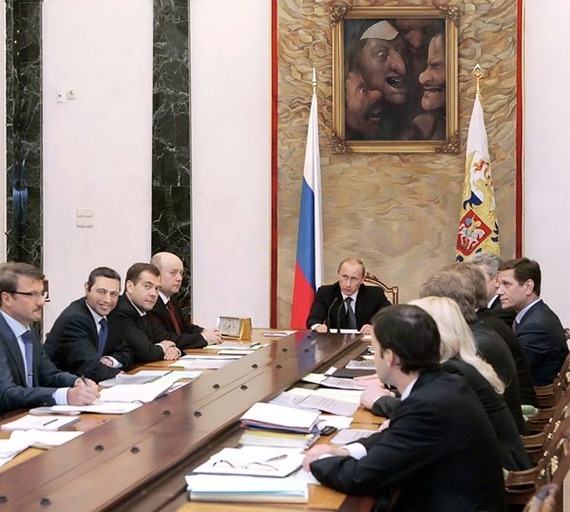 Three leering heads from Christ Carrying the Cross by Hieronymus Bosch rhyme rather nicely with the expressions of politicians in conference with Vladimir Putin. 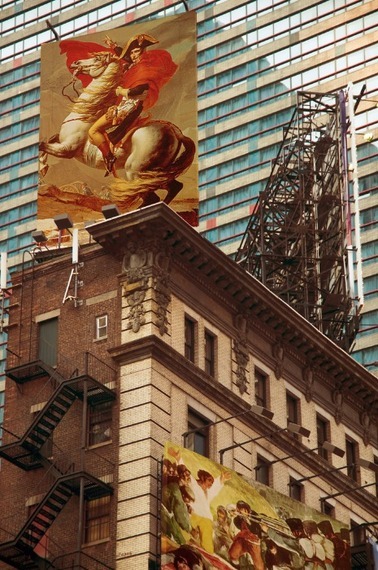 Jacques-Louis David's image of Napolean Crossing the Alps -- which has appeared in far too many cognac ads -- radiates triumph on a rooftop billboard. Goya's Third of May, 1808, which can be glimpsed on the billboard below undercuts David's painting by dramatizing the atrocities committed by Napolean's troops in Madrid. 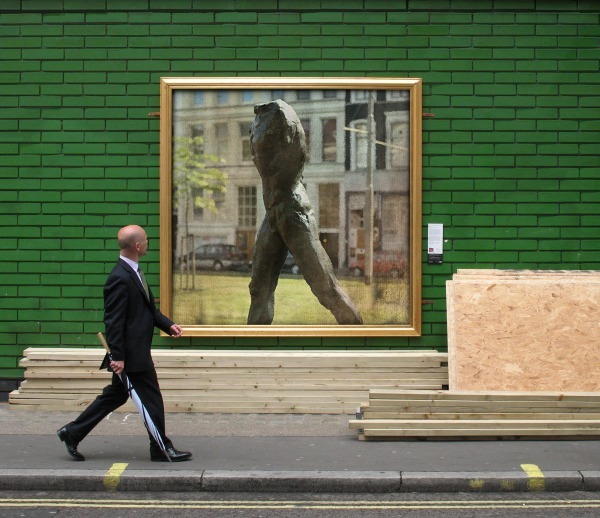 A sense of kinship is apparent as a man walking glances at Rodin's Walking Man. 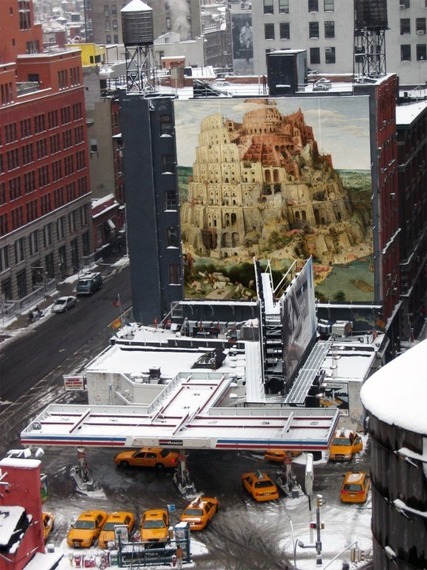 Pieter Bruegel the Elder's Tower of Babel feels like a cautionary tale seen as a New York mural. 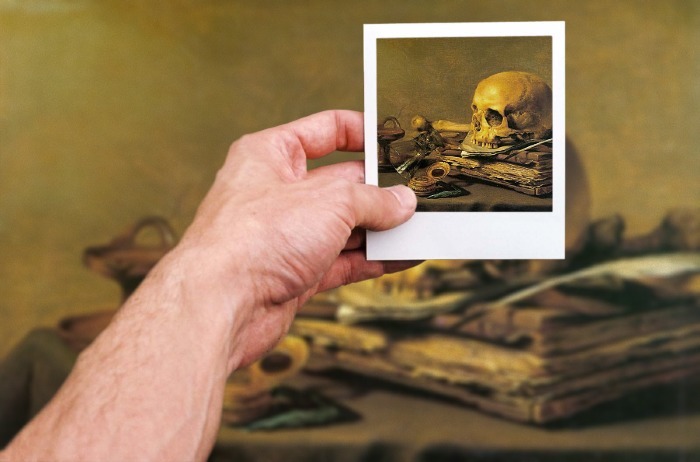 A hand-held photo of Pieter Claesz' Vanitas Still Life suggests that the contemplation of mortality continues through time and technological change. Finally, a "wild-card." What happens when you take an Instagram post by suicidegirls, which artist Richard Prince recently re-contextualized as a work of art for sale, and re-contextualize it again as a work of art in a traditional museum, where people might take photos of it and re-Instagram it? 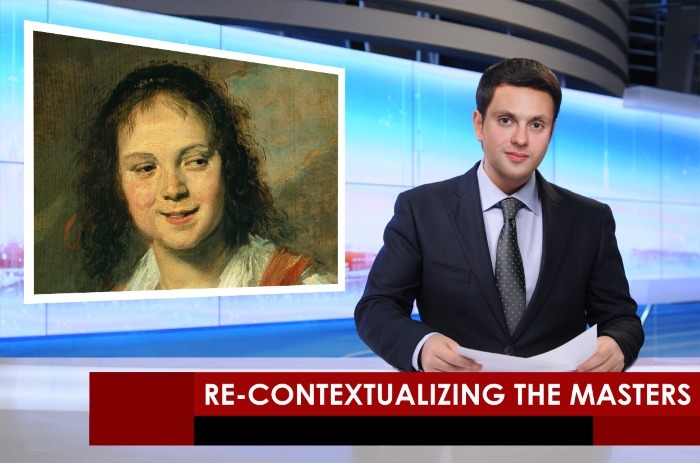 If you are inspired to try re-contextualizing works of art at photofunia.com, I hope you will email me some of your best efforts at seedblogs@gmail.com. I'll share some of the best ones on Facebook and Twitter.